Always looking for new genealogy tools, I happened on the blog Georgia Black Crackers, http://georgiablackcrackers.blogspot.com/, authored by Mavis Jones. In working on the blogger theme of “Expanding your Knowledge,” Mavis had created a timeline for her great grandfather Cornelius Pierce: http://georgiablackcrackers.blogspot.com/2010/02/day-5-of-winter-2010-geneablogger-games.html The interactive tool she used so effectively was TimeToast, a free web-based timeline application at http://www.timetoast.com/. All you need to sign up for this free application is an email address. 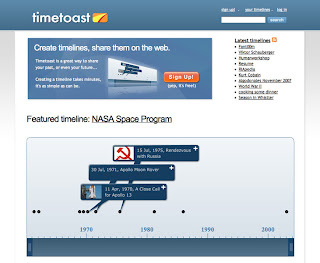 With TimeToast, you can create multiple timelines, add events and timespans and even upload pictures. The reader can click on a pin-point, and a balloon populated with the details pops up. Although this interactive application can be used for any timeline needs, for genealogists, it displays your ancestor’s activities - their progression, migration or events - at a glace, which is what Mavis does for her readers. Once created, you can embed your timeline(s) on other sites, as done on the Georgia Black Crackers site. Thank you for the recognition. It is very much appreciated. Mavis are you also QVCDiva? Is this you? Who's Hanging From Your (Family) Tree?